Living in the country, we just love seeing the beautiful horses and horse and carriages on the road. It really makes us feel like we are somewhere different. Have you ever wondered what it would be like to live in one of LandVest’s properties? We invite our owners to tell us a bit about their experience, what they love about their homes and a bit of their history. 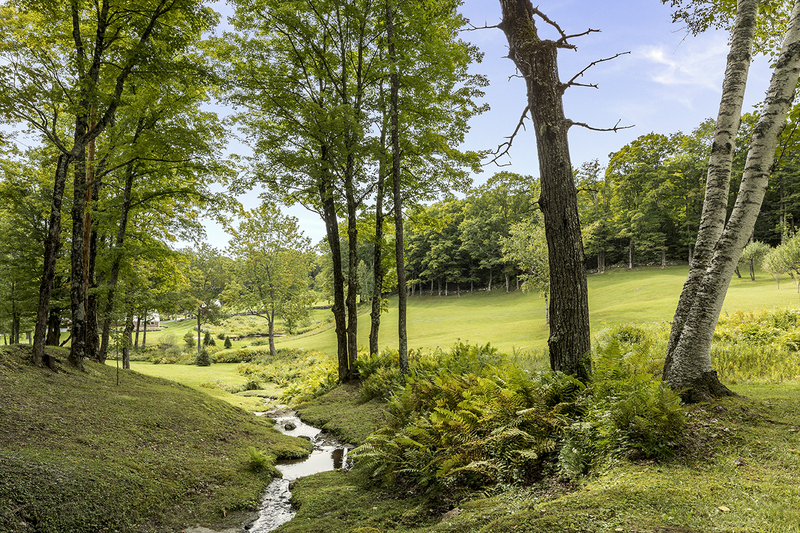 We interviewed the owners of Sheep Run Farm who shared some of the special qualities of their property. 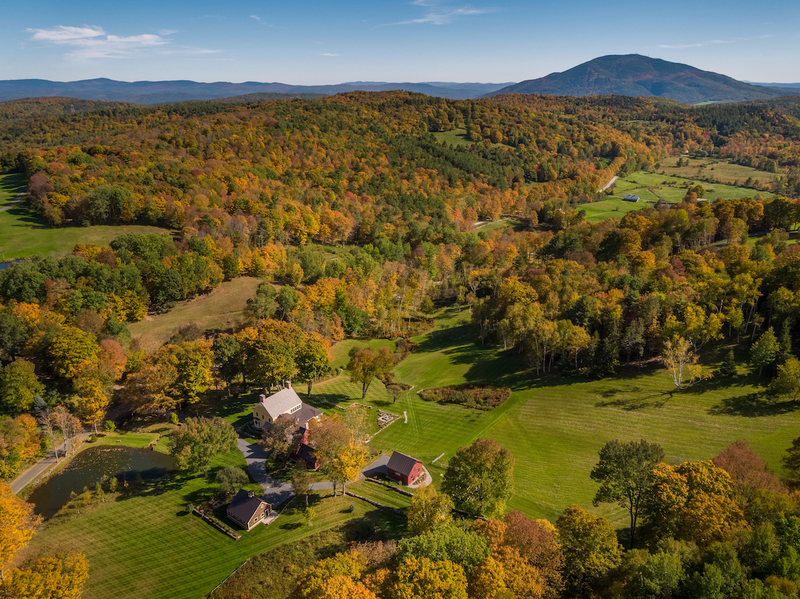 LandVest: Deb and Garrett, you commented earlier that there was something that really called to you about this property, a lovely old farmstead in the heart of horse country outside Woodstock, Vermont. You said you immediately felt it, and that you kept coming back to this place. 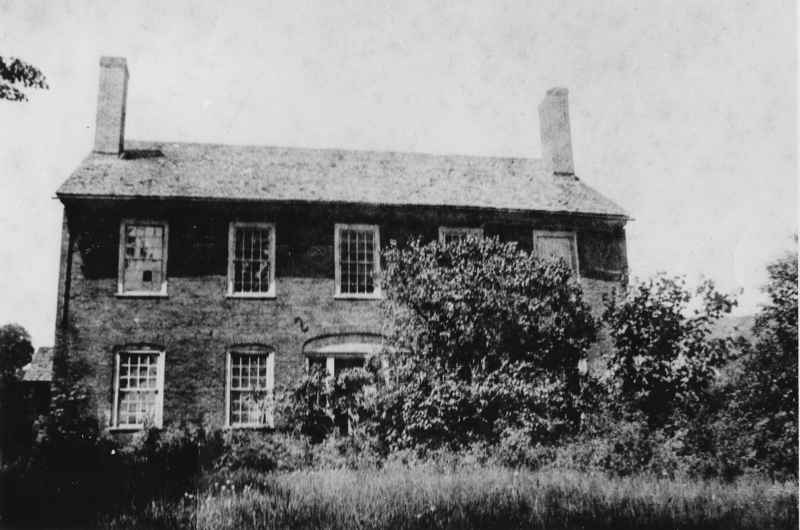 The property was settled by the Taylor family in the late 1700s. Simeon Taylor was the father of Ira Taylor. According to records, Ira Taylor built a beautiful brick colonial home here in 1842. We have pictures of it during its time of demise. Our current home was designed in its image. We didn’t know for sure what became of the original home, but we have made use of all the brick we could find from it; namely the garden pathway and the flower bed edging. Ira was a prominent sheep farmer in the day and built many pens or “runs” on the property to contain his large herd. At this very time in history due to the Civil War buildup, wool was experiencing a market price “run”. Hence the name….Sheep Run Farm. The previous owner maintained this property spectacularly; we both greatly appreciated the care they took in the land and with the carriage house. They just did not have the opportunity to complete their vision. To have the ability to live and work here for a number of years and then to be able to complete our vision, put our stamp on the land, was a wonderful opportunity. 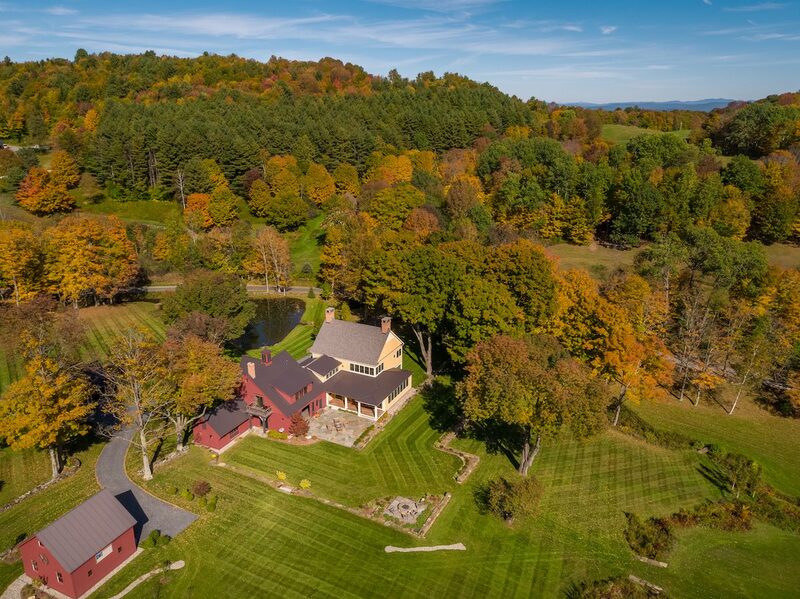 The approach to our home has always been a significant checklist item and we just love the beautiful estates and farm land that surrounds us. We recently built the main home, detached garage and renovated all other buildings. Our goal was to have a truly Vermont vernacular home. We began the design process in the summer of 2014 and completed construction and landscaping in early summer of 2017. Our architect is a great one out of Connecticut, who has done work for us on other properties and in other states. His name is Jim Denno for Denno Designs. Jim has designed home and remodels for Hume Cronin, Jessica Tandy, Paul Newman, ……… Our interior designer, also, has worked with us in the past on other homes. Her name is Linda Heinz from Arizona. We could not be more happy with the collaboration we had with Jim and Linda. We all had a hand in creating our dream home. The balcony off the back of the Carriage Barn is a favorite spot to take in the views. The attached carriage house with its second floor guest suite. Garrett: My favorite room in the house…gotta go with two. 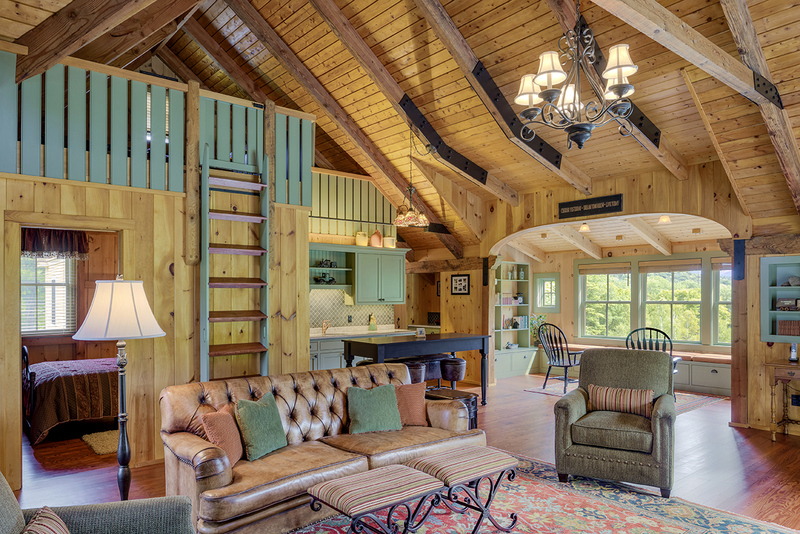 The carriage house room with its wood walls and ceilings make you feel comfortable and at home. With the woodstove on and a great conversation, the space can’t be beat. My second “room” is the carriage house’s rear balcony. You can overlook much of the property while enjoying the setting sun. A quiet place to just relax. Classic on the outside, hip on the inside, the farmhouse’s first floor has an open floor plan, with large windows and high ceilings, abundant light and views from every window. Deb: My favorite room is the kitchen. Not only is it equipped for a much better cook/baker than I, but the kitchen is always the gathering spot for good food, conversation and drinks. I love the fact that the kitchen not only welcomes this, but it is open to the dining room, bar area, sitting area and the family/great room. Everyone is always part of the family, no one is ever left out. I just love everyone being together and there still be a ton of room. Willow Brook with its cascading falls. Garrett: It’s hard to stay brief when talking about the property’s special features. There are waterfalls, two ponds, apple orchard and a rolling topography. The trees are amazing! We worked tirelessly to integrate the buildings with each other and the land. People often slow down and take pictures as they pass by. I guess they think we did a good job. LandVest: As an aside, Garrett and a helper restored miles of the original sheep runs and stone walls that line the fields. Deb: It really is amazing to me that every time family, friends or just visitors come they describe an immediate sense of calming and a Zen-like feeling. I just could not agree more. This property has a special feel to it that I have never experienced before. We have owned over eight homes around the country, have traveled the world and I personally have not ever felt this feeling before. Walking the land in the morning with our coffee or wine at sunset will truly be missed. Garrett + Deb: Great medical care was very important to us. When we purchased this property we had no idea how long we’d own it, so to be close to great care was extremely important. It is a huge benefit to have local doctors and hospitals nearby and to have Dartmouth-Hitchcock so close. We appreciate how much access we have to trails for hiking and running, basically right out our door, but, also how close of a drive it is to experience other trails for skiing, cross country skiing, snowshoeing, and mountain biking…if you are into that. I guess you can’t forget how close we are to lakes and the river for boating, kayaking, canoeing, and fishing. For us, it truly is a very centralized location to everything we could want. View of Mt. 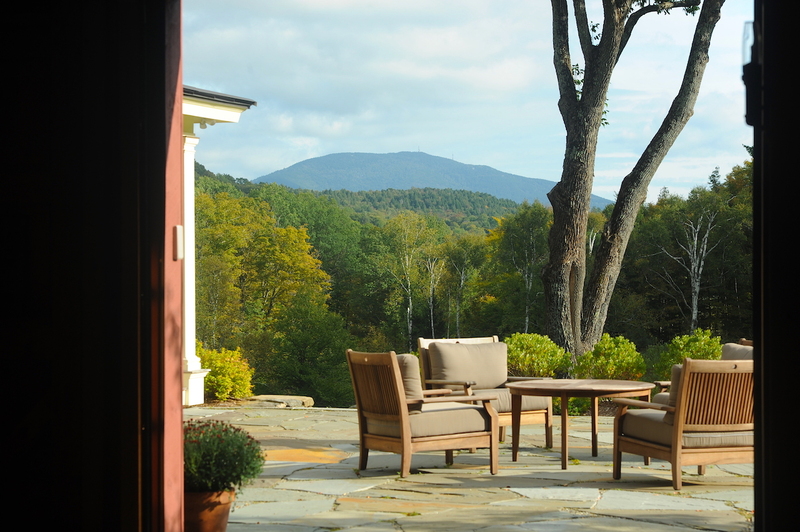 Ascutney from the back terrace. Garrett: I love to watch the light. 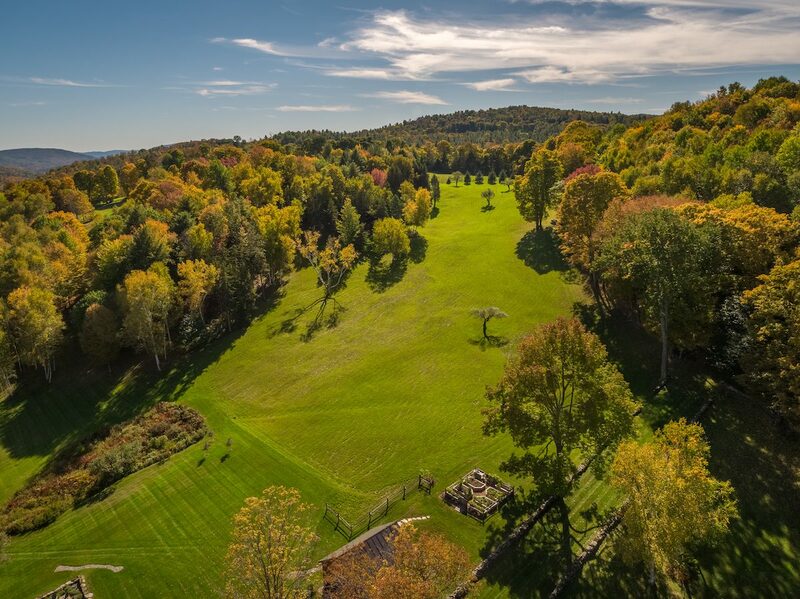 Vermont’s light and shadows are magical and this property is no exception. My favorite spot to watch the evening change to night is on the back terrace. You can see the once crisp shadows fade as the color tones on Mount Ascutney go from green to purple to black…amazing. Deb: Wow, to pick one favorite spot on the property is impossible for me. We have created numerous sitting locations throughout, all with different views of the meadows and long range and short range views of the mountains. We have stone bridges over the brooks that create great hiking/walking paths. Basically, we truly enjoy every inch of the property. Garrett + Deb: We have owned this property for eleven years and spent eight of those years dreaming and planning of our completed vision. We have now completed that vision. It is time for us to move to our next stage in life and hand it over to someone who will appreciate, care for and enjoy Sheep Run Farm as we have. LandVest: We are delighted to help find the next stewards of this remarkable place. For more information on Sheep Run Farm please contact Chris Lang, Dia Jenks or Ruth Kennedy Sudduth. 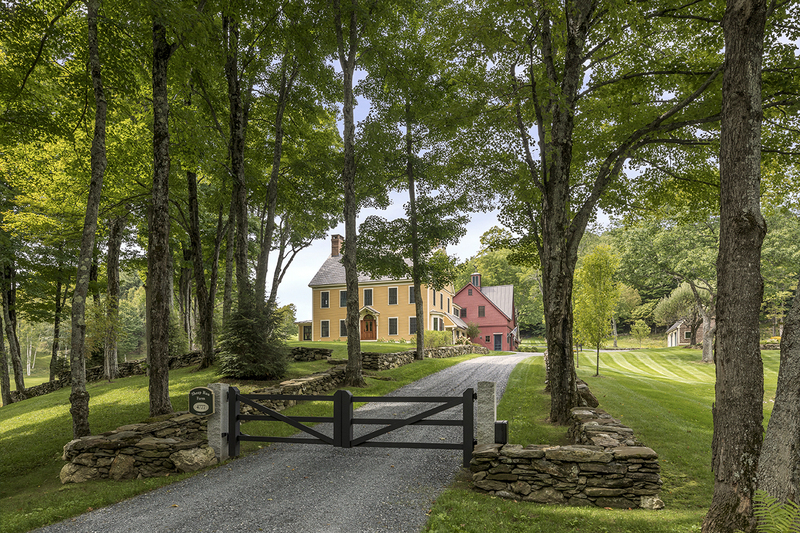 Click for more great Woodstock and Vermont properties.